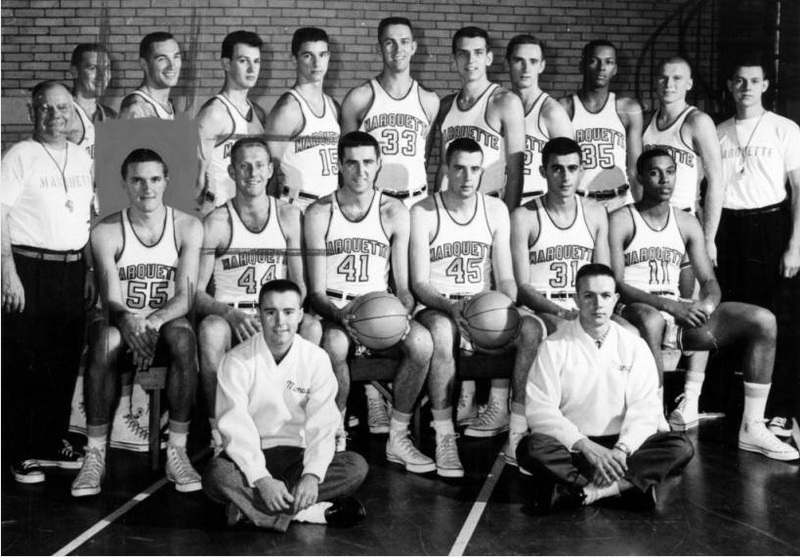 “A terrific year except in the loss column.” These words of Coach Eddie Hickey explain the 1959-60 basketball season. The Warriors, who concluded the season with a 13-12 record, played good basketball, but at times a shade too little of it. The habit of losing leads, which Hickey attributed to lack of depth and height, cost them six victories. Don Kojis led the team in scoring with 523 points, a 20.9 average per game. He missed Marquette's season scoring record of 526 by three points. Kojis and Walt Mangham, the “Kangaroo Kids”, combined to make the nation's best two-man rebounding team in college basketball during the 1959-60 season. Kojis snared 384 rebounds to place eighth among collegiate basketball leaders. Mangham's 341 ranked 16th. Mangham was voted the team's most valuable player.